Siberian motherwort, or leonurus sibiricus as it is called in scientific journals, is the most common form of motherwort sold commercially. 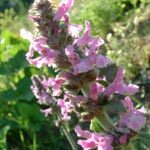 Few motherwort side effects are in existence, but it still makes sense to find out what they are prior to using this herb. You can experience motherwort side effects whether you take the herb in tea, tincture, pill or liquid form. If you have hypothyroidism, motherwort herb can cause you serious medical issues. Your metabolism, mood and overall health can change for the worse if you introduce too much motherwort too quickly into your system, or even if you stop taking it abruptly. Instead, wean yourself off of motherwort slowly over time just as you would increase your dosage over the course of several weeks. Generally, new mothers experience the most pronounced motherwort side effects. Sharp changes in hormone levels and thyroid activity can occur while you use motherwort. Ironically, many motherwort uses are of the biggest benefit to women who have given birth and are regularly breastfeeding. The best way to prevent these potentially harmful side effects is to use motherwort tincture immediately after giving birth and to monitor your future motherwort consumption. Women of childbearing age are also advised of possible motherwort side effects as the herb can actually be harmful during pregnancy. This herb may cause vaginal bleeding in some pregnant women. Lastly, motherwort can cause issues in the human body if it is taken in excess. When a dosage of more than 3,000 mg is exceeded in a 24 hour period, stomach cramping and diarrhea can occur. Limit your intake of the Siberian variety of motherwort and all other types of motherwort to prevent upset stomach. If you are not pregnant, it is likely that you can use motherwort to improve your health with minimal side effects. Consume a safe amount of motherwort, and refrain from bombarding your system with this herb. Let your doctor know that you intend on taking motherwort to ensure better health, and follow his or her guidelines closely. Avoid the side effects of motherwort by acting responsibly as you would with any other herbal supplement.